There's always something new going on here at the American Treasure Tour - new additions to the collection arrive pretty regularly. Earlier this month, a life-sized figure came in adorned in the colorful colors of royalty. HIs name is King Kandy and he strands over five feet tall and rules over the land of Candy Land. 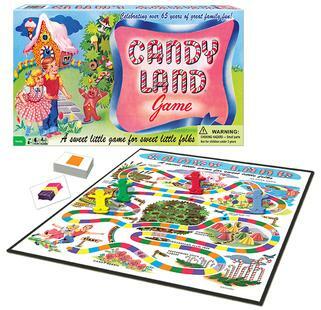 Candy Land was introduced to the world when convalescing polio victim Eleanor Abbott, stuck in the hospital in San Diego, came up with the idea and tried it out on the kids she shared the polio ward with. That was in 1949, before medical pioneer Jonas Salk developed the polio vaccine. With the encouragement of the kids, Abbott submitted her game idea to the Milton Bradley Company, which at the time manufactured mostly school supplies. It quickly became Milton Bradley's biggest seller, and put them in league with their biggest competitor, Parker Brothers. The game has proven timeless as an aid to young development. There's no strategy involved, which makes it simple and straightforward. When Hasbro purchased Milton Bradley in 1984, they added a storyline and characters to the game. That is likely when King Kandy came along - the jolly and full-figured resident of a castle made of sweets. Nowadays, King Kandy has to compete with such more-famous characters as Winnie The Pooh, Dora the Explorer, and SpongeBob, all of whom have their own versions of Candy Land on the market as well.